I have been so busy again, feels like that a lot these days! But I am loving that the days are warming up and I can open up the house again for fresh air. 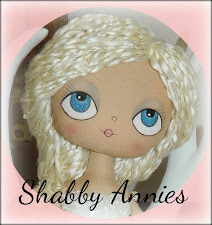 My face book page http://www.facebook.com/ShabbyAnnies is coming along quite well, I have 88 fans so far and have sold a few of my dolls. I have also gotten a few orders which I have been managing with more ease than before. I am taking part in a doll showcase in November and have to design and create 2 dolls to enter under the theme of Nostalgia Love. I have 5 dolls heading off to the local markets in 2 weeks with a friend. I don't have enough to hold my own stall. So I'm a bit excited about all things at the moment. I have 2 more orders to get done before Xmas and have been very busy designing new patterns, which I can'ts seem to find time to get around making yet. I love these shabby pumpkins, no machine sewing required. Can't wait to try the stamp on some fabric or hessian!! All wonderful of course..we missed you again today,Cate said she is going to contact you lol..we do really miss you but understand,i am going to try to make a time to get to visit you ans sit in your room and you can work as we chat,and the main thing is to offload some of my things to you! lol..have a wonderful week Paula,the girls all send their love.